A superb new Rock band set to debut at Dreadnoughtrock after an explosive first year. Singer Aaron King and guitarist Michael Mackay started the project as a way of making a bit of cash by playing covers. After a few jamming sessions, they discovered that they worked well together and began writing original material. It was then decided than a full band should be formed. They had various musicians auditioned for the band and the line-up was complete when bassist Shaun Alderman and drummer Calum Thomson joined. After 2 months of being a band, they recorded their first EP at Post Electric Studio in Edinburgh with producer Rod Jones (Idlewild). 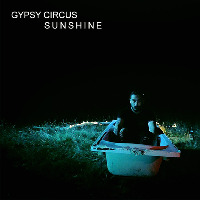 With their new EP 'Holy Lights and Shadows' set for a release in early 2019, Gypsy Circus are starting to make waves.